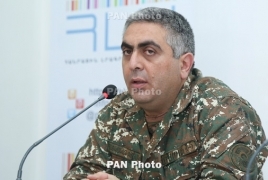 PanARMENIAN.Net - A Nagorno Karabakh (Artsakh) soldier wounded by Azerbaijani troops on May 13, will be transferred to the Armenian capital city of Yerevan, Armenian Defense ministry spokesman Artsrun Hovhannisyan said in a Facebook post. It was reported on Monday that Sergeant Shamkhal Petrosyan had been taken to hospital and undergone surgery. His condition is deemed grave. The situation on the contact line between Karabakh and Azerbaijan remains relatively calm on the week of May 6-12.